Last summer we heard that many tween budding artists were eager to go beyond our classic kids’ camp. We’re excited to announce that not only are we again offering the most creative camp in town, we’re also launching a NEW specialized offering just for tweens! Similar to our teen option, this camp encourages skill building through longer length studio sessions enabling tweens to create focused projects, while also exploring art media and techniques in greater depth. Like all of our camps, it is taught by talented teaching artists. 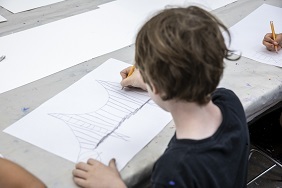 On Fridays, celebrate your tween's creations during our culminating art exhibition from 2–3PM. Don’t delay—we anticipate this offering will sell-out as our teen camp did last summer! Make your own jewelry! Tweens will experiment with jewelry-making techniques to create rings, pendants, and bracelets of their own original designs. After starting with a sketch, the instructor will help teens using a variety of materials to create their vision.Projects may include, but are not limited to, wrapped wire pendants and rings, polymer clay canes, and recycled paper beads. Using simple tools, tweens will learn the basic terminology and techniques of textile arts. Looking to examples for inspiration, tweens will explore how the use of color and texture can impact their design. By the end of the week, students will have unique pieces of fiber art that can be displayed on a table or wall!